Things have been fairly quiet around here haven't they? In all honesty, that shouldn't serve as a surprise to anyone who regularly reads this blog and thus, would be aware of my inconsistency over the years, not to mention some troubling recent months. Despite this silence I can assure you that the blog isn't dead and neither is my passion for writing on it, thinking about games in a critical or analytical way and, indeed, aspiring to my personal goal of covering the racing game genre because no one else seemingly will. Speaking of which, I have news! It's my great pleasure to announce that I have an article published in the latest issue (#5) of Ctrl.Alt.Defeat, an e-zine that you can find here. The theme of the issue is guilt (and related emotions) and I took the opportunity to experiment with my piece and try something different -- not only in terms of writing generally, like my review of F1 2011 last year for Pixel Hunt (another e-zine, coincidentally enough), but also in terms of my Living The Life story. As most of you would know, my F1 2010 (and beyond) role-playing story has so far been firmly focused on the actual rounds of the championship, leaving no room for anything else. If I am to be honest, this format -- as crucial as it is considering it's the entire point of doing it to begin with -- became rather dull, fast, and that in turn provides some explanation as to why the first season hasn't seen its published conclusion yet, despite being finished over a year ago now in terms of playing. I imagine the format isn't that exciting to read, either, when a good portion of it involves describing small moments in various corners (such as running wide or locking a brake) which, let's be honest, would mean very little to people either uninterested in Motorsport or racing games, or who aren't familiar with the tracks that I'm talking about. I have tried to enhance the story series somewhat by adding exposition to certain points as they come up, such as explaining issues with traffic or discussing a circuit's pit-lane, but even with that I feel like the format as a whole is probably boring to all but the absolutely most dedicated, which to be honest only feels like myself. Why do I feel like that? Well, firstly I realise that few people have an interest in the racing genre as a whole let alone the Formula 1 games and then, beyond that, my attempts to create a story out of my experience. I understand that what I am essentially doing is niche, and unlikely to interest most of my readers. But having said that, I also believe that this experiment I am doing -- creating this story -- is important in the sense that it can be used as a platform to highlight some interesting issues (within the sport, within the games, within gaming in general), and that it can also enlighten us in unexpected ways. 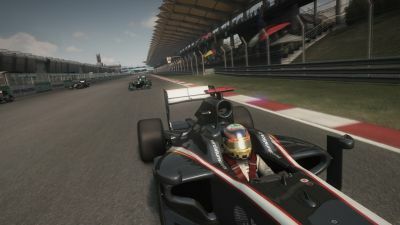 As the player who is actually doing the story, I know it has certainly given me an amazing insight into things that I was previously oblivious to, and I'm someone who is immensely experienced with the genre and racing in general. Using that experience and knowledge to convey the less-obvious aspects of a game or the hidden attributes of a particular approach feels like a worthy endeavor, and is something that I find both fascinating and valuable -- especially if by doing so I can inform others. So, behind the scenes, I have been thinking about ways to enhance the series and make it better, so it still does what I set out for it to do when I originally started it but does so in a (hopefully) more entertaining way. I feel I have discovered a way to improve the series and plan to implement those changes when I commence season two (believe it or not, despite silence for months now, I am still fully committed to this story) some time in the near future, but in the meantime my article in Ctrl.Alt.Defeat serves as a teaser for that change in approach. By focusing on a particular emotion, guilt, and writing about its impact on both the driver (IE: me) and the category of Formula 1 at large (and thus, by extension, Motorsport in general), the piece enabled me to highlight some of the things that are critical to racing but, for the most part, are usually overlooked. It was an opportunity to frame my story with a different but related perspective, and as a result not only do I think the piece came out brilliantly but it also gave me a foundation from which to build when it comes to making those aforementioned changes for season two. Suddenly, as if almost out of nowhere, I can make the entire Living The Life story much bigger than just the individual rounds of a given season, and that feeling has certainly reinvigorated my motivation for continuing the series. So check it out and, should you want to, let me know what you think. It is somewhat left-field when compared to the other articles found in the issue -- again, I realise racing games aren't the most compelling genre in this medium for most people -- but it was a pleasure doing it, and I look forward to doing similar things in the future. And hey, if you're not interested in reading my article then check the issue out anyway as you'll find some great content penned by some great people, including Katie Williams, Ben Abraham, Alex Maunder and the Experience Points guys Scott Juster and Jorge Albor. Finally, I'd like to take this opportunity to thank Dilyan Damyanov for giving me the opportunity to begin with. It has always been a small dream to be published in a print context (rather than just online) and that desire has now been fulfilled, so thanks Dilyan, it's really appreciated! Now that I've told you about that, I suppose I should explain what has been going on with the blog. As I mentioned above I haven't lost interest in writing, thinking about games or covering the racing genre. In fact, my desire to do so and my passion for it has only increased as each month has passed. Yet the silence here in recent months suggest that there's something up, and that bears addressing. While I won't go into details, lately I have been dealing with some personal issues that began in December and continue (although nowhere near as badly) even now. That, along with life commitments and various other things combined to make writing for Raptured Reality more difficult than I'd like, and whenever there was an opportunity or three I was always too unmotivated to do it. I feel like the tides are changing again, however, so with any luck posting will resume on here in the near future. I'm not going to commit to a time frame or suggest that I'll be back by a certain date, because I've done that before and it has never panned out that way. But rest assured that this blog isn't dead, I still want to use it to post my opinion and analyse games, and that stuff like my Metroid Marathon will be resuming soon. Thank you for your patience, for sticking with me and, indeed, for even reading Raptured Reality to begin with. It means a lot to me -- more than you can imagine -- and I look forward to things returning to normal around here very soon. Until then, however, enjoy your games and keep expressing those opinions on them -- it's why we are all here to begin with, after all! Don't worry about not being able to post as much I am swamped myself with the real world. As for me I'm taking my love of games and making it a real life thing to host events with actual developers! Your blog does bring me joy to a genre I don't usually play. Because of you, I personally played F1 and feel in love with it! Gaming In Public -- I only worry because silence on most blogs usually means they are dead, whether their authors actually mean it or not. I don't want people thinking that for Raptured Reality because I sure as hell do not want this place to die. Not after over four years of posting, anyway. Also, sorry about the delayed response.